Frontline beach properties have always been ‘premium’ properties. Who would not like to fall asleep to the gentle rhythm of the waves, or wake up to the sun shining on the Mediterranean and only have to take a few steps from home to place their feet in the warm sand. Sotogrande is fortunate to have several beachside residential communities available and at Holmes Sotogrande we pride ourselves in offering the best of them. For example, this three-bedroom, three-bathroom apartment in Paseo del Mar is walking distance from the Octogono Beach and Tennis Club as well as the Royal Yacht Club. The residence consists of an entrance hall, fitted kitchen, living-dining room with access to a covered terrace, three bedrooms with fitted wardrobes and three bathrooms, and parking in the communal underground parking. This two-bedroom, first floor apartment in Apartamentos Playa is south-facing and full of light. It is also near the Octogono Beach amenities and has a living-dining room leading to the covered terrace, fully fitted kitchen and two twin bedrooms with en-suite bathrooms, both with access to the spacious terrace. Other features include air-conditioning, central heating and a parking space. Property at Apartmentos Playa is always in demand and we’re delighted to also offer this three-bedroom, three-bathroom apartment in the popular complex. It offers a convenient location with beach and tennis club nearby and consists of: fitted kitchen, living/dining room connected to a terrace with fantastic views over the communal gardens and sea, master bedroom ensuite, including special Turkish bath, and two further bedrooms with private terraces. Other features include hot/cold air conditioning and parking space. 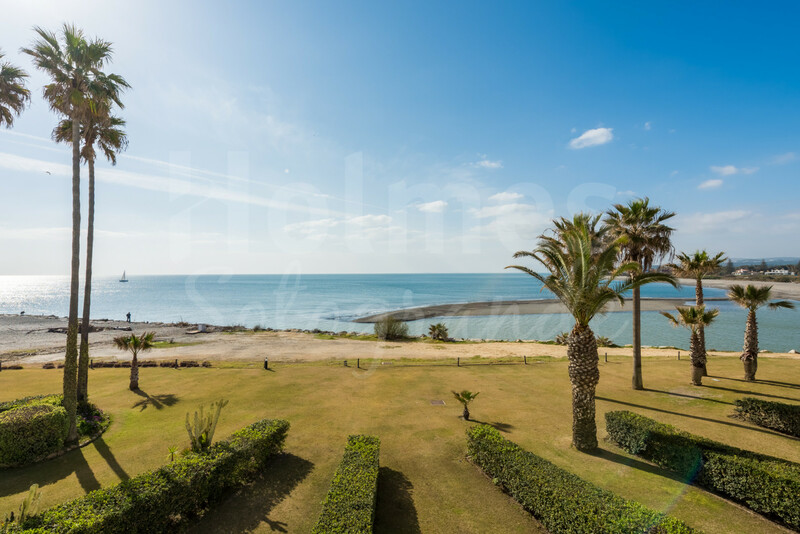 And if you are looking for more ample accommodation, then this four-bedroom, second floor apartment overlooking the River Guadiaro estuary and with views to North Africa and Gibraltar ticks all the boxes for beachside living. The accommodation consists of an entrance hall, fitted kitchen with access to the rear terrace, living/dining room with access to the main and rear terrace, four bedrooms and four bathrooms. It includes hot/cold air conditioning and one parking space in the communal garage. This is just a small selection of the stunning beachside properties available in Sotogrande and we’d be delighted to show you these, or any of the others in our portfolio. Please contact us to discuss what you’re looking for and arrange a viewing.